These bars have a funny name, don't they? Well, maybe that's because they are supposed to be for kids. Kiddie or not, this is a vegan and organic bar that is actually quite tasty and under 100 calories. These are made from the makers of Larabar, but unlike their moist, date-y cousins, these bars are light and crispy, yet have some chewy density so that you feel decently satisfied (with some milk/soymilk, ideally... I wish I had these as a kid!). 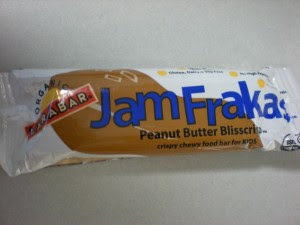 These come in a few flavors, though peanut butter goes really well with the texture. None of them are very sweet, which is good, but trust me, they are tasty! I found these at Trader Joe's. i just got these this weekend to try!